I am so ready for cooler weather and apple picking season. I love using up fresh fruits to create delicious ideas in the kitchen. 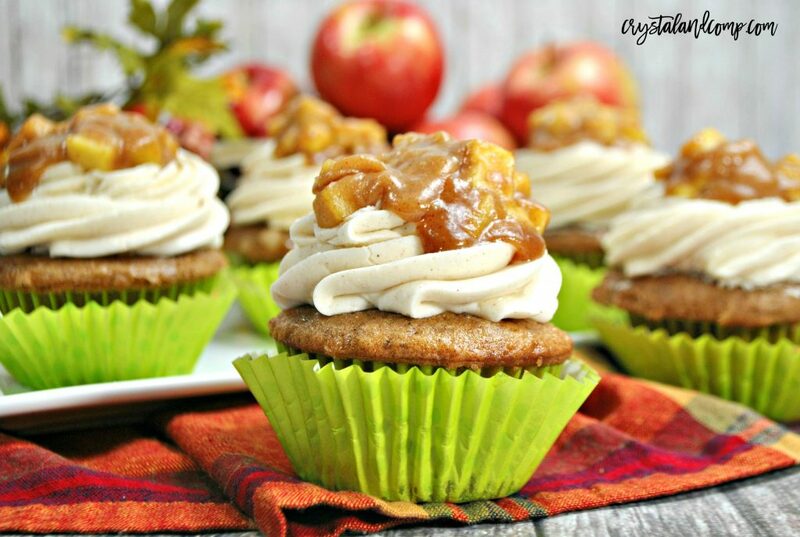 If you’re on the hunt for amazing apple recipes, this apple pie cupcake recipe is a crowd pleaser for sure. Oh, they smell just like fall when they are cooking. Don’t fret, they are not hard to make at all. They come together quickly, even the homemade icing we top them with. 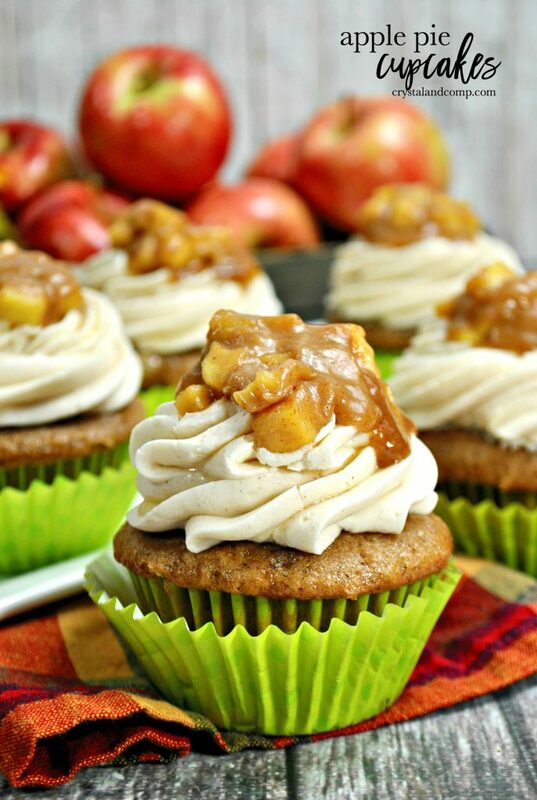 And, those are fresh apples on top of that icing. Here is everything you will need to make the cake, the topping and the icing. Using a standing mixer, combine the cake mix, eggs, milk and butter and mix until well combined. Add cupcake liners to you muffin pans. This will make approximately 22 cupcakes. Scoop cupcake batter into the liners. Only fill them about three fourths of the way. While the cupcakes are baking, let’s make the apple pie filling real quick. Using a medium pot, melt your butter. In a small bowl, combine the remaining 1/2 cup of water with the cornstarch, and whisk lightly until it’s smooth. Add the cornstarch mixture to the apples and cook 1-2 minutes longer, until the mixture has thickened. Set it aside and let it cool completely. Using your standing mixer, combine all ingredients and mix on medium speed. Mix until you see stiffed peaks. Fill your frosting and scoop into piping bag. Using the frosting, pipe the frosting onto the cupcakes. You want to make sure you keep the tip of the frosting flat so that the apple pie filling can sit on top of the frosting. 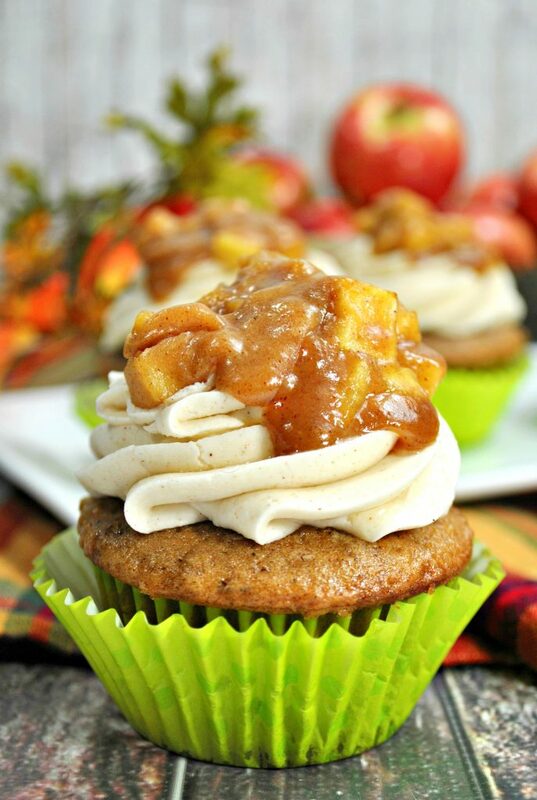 Scoop about 1-2 tbsp of the apple pie filling onto the top of the cupcakes. While the cupcakes are baking, let's make the apple pie filling real quick. In a small bowl, combine the remaining ½ cup of water with the cornstarch, and whisk lightly until it's smooth.